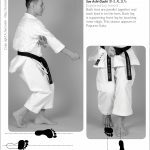 Soe Ashi-Dachi 添え足立ち (Supported Leg Stance) Both feet are parallel together and back foot is on the toes. Back leg is supporting front leg by touching inner thigh. This stance appears in Papuren Kata.